The Madison Lint album is stalled, but will see the light of day eventually. Several of the tracks are available for download here and can be purchased on CD as part of Mark's 23-song 1991-2003 compilation The History of Lint. Hear about Mark Lint's current band New People. 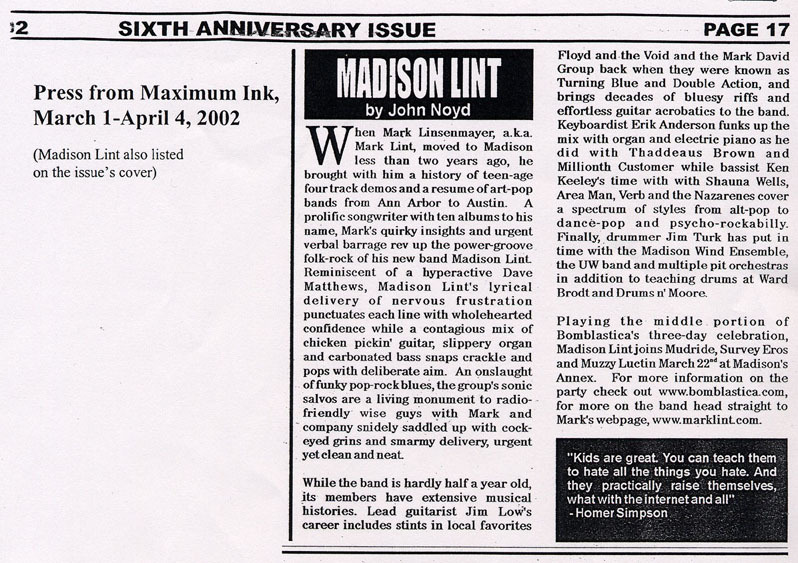 Read the Madison Lint write-up in Maximum Ink magazine. Check out Mark Lint's other musical projects. Madison Lint is a Madison, Wisconsin band that plays power-groove folk rock (or something like that). They offer catchy, memorable, original tunes with trippy and often amusing lyrics. They exude parts brash punk-pop and tasteful vintage blues/R&B. There's some swing, some vaguely ethnic tunes, some psychedelia, some sweet folky gems. …All tight, all well-crafted, all stuff that people like to listen to while driving cross-country in a Nyquil-induced stupor. 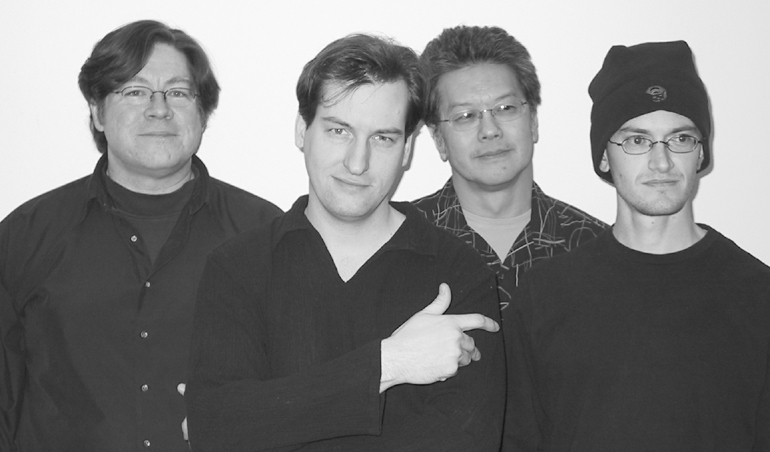 Bluesy lead guitarist Jim Low, who comes to the project with many decades of professional experience. He was featured in local bands Turning Blue (now known as Floyd and the Void) and doubleAction (now known as The Mark David Group). Eminently solid, tasteful bass-man Ken Keeley also plays with folkies Shauna Wells and Julie Scharm and has played with Madison legends Verb, as well as Area Man, the Nazarines, and many others. The new guy is ace rock drummer Joe Mitchell, trucking in from Fon Du Lac to fill out the lineup for our upcoming shows. For particular shows, Madison Lint livens up the procedings by throwing in a great keyboardist (e.g. Luke Palmer of Synchronous Soul or Erik Anderson of Reason for Leaving/Ivan Klipstein/Thaddeous Brown/etc.) or swapping in a bassist (e.g. Tom Broeske of Sean Michael Dargan/former Spanic Boys/Zoo Records or Tim Peeters of Prole/Jazz in the Box) or drummer (e.g. Jim Turk of Prole/Madison Wind Ensemble or Marcus Looze, whom you may have heard on NPR or somewhere addressing environmental issues). For those of you interested in Madison Lint's full story so far, we've put together some history. Please send feedback or get on the mailing list by e-mailing us at mark@marklint.com. Please spread the world. E-mail a friend about this page now. Well, you can make your own from mp3s, of course, but we're also happy to give you one. All you need to do is decide which ultra-special limited time freebie/deal-of-a-lifetime offer you wish to take advantage of, e-mail the band your name and your choice, and come to one of our upcoming shows. You can choose between an absolutely free 6-song Madison Lint sampler and a vastly discounted (down to a measly $5) copy of Mark's 23-song 1991-2003 compilation The History of Lint. Saturday, May 8 at Tippers in the Wisconsin Dells (206 Broadway, 608-253-5981) . Madison Lint plays 9:30pm-1am. No cover charge. Saturday, May 15 at Conways in Milwaukee (2127 W. Wells, 414-344-1262 ). Madison Lint plays from 10pm to 1:30am. Cover charge: $4. Friday, April 2, 2004 at the Olympia Resort in Oconomowoc. Friday, February 6, 2004 at Fyfe's Corner Bistro (1344 E. Washington Ave. Madison, WI., 608-251-8700). Mark Lint joined by a Linter or two from 7pm-10pm, no cover. Saturday, February 7, 2004 at the Mission Coffee House (1319 Strongs Ave, Stevens Point, WI., 715-342-1002). Madison Lint Stevens Point Debut! Music from 8pm to around midnight, with Stevens Point's Tree of Woe playing the first hour. Friday, 12/12 at the Olympia Resort, 1350 Royale Mile Drive, Oconomowoc. (800) 558-9573. Madison Lint stretches out for a mighty 4 hour show, 9:30-1:30, with a premier appearance at this pleasant venue between Madison and Milwaukee. No Cover! Friday, 11/7 at Linnemans 1001 E. Locust St., Milwaukee. JAM FOR THE CURE: A benefit for the Leukemia & Lymphoma Society. Appearing with Misses Murphy, eVibe, 40 a Piece, Gypsy Kitchen, and Circadian. Headlining at Liquid Lyrics, Friday, October 10. 614 S. Park, Madison 256-0642. The music starts at 11pm, with Milwaukee's great acoustic fusion band eVibe starting things off and Madison Lint playing until close. Prior to this show, you can see the comedy antics of The Ark Improvisational Theatre. Headlining at Luther's Blues in Madison, September 23rd. Featuring Stevens Point's Tree of Woe and Beloit's The Melissa Ramsey Trio. Wednesday, May 28, 10pm at the Anchor Inn, Madison. 1970 Atwood Ave., Madison 244-6095). With Illuminati and TUGG. Saturday, June 28, 11pm at the Grid Iron, Madison. 1509 Monroe St., Madison 256-3811. July 19th, 9pm-midnight at the CHANCERY RESTAURANT, 2100 E Moreland Blvd, Waukesha, 262-549-1720. Saturday, January 4th, 2003 at Liquid Lyrics Lounge, 10pm. Opening for the funktastical Groovulous Glove. Friday, August 16, Ken's Bar, 10-11pm, Opening for touring act from Chicago 56 Hope Road. Friday, June 28, live on WORT on the Hootenany with DJ Dave Zero. Wednesday, April 17th, 10pm, Regent St. Annex with Tangy and the Cudahys . Tuesday, April 9, 8-11pm, Ken's Bar. Friday, March 22, 9-10pm at the Regent St. Annex (Madison) as part of Bomblastica, a many-band festival event spanning three days with some of Madison's biggest names (Muzzy Luctin, Moon Gypsies, Universal Soul Ensemble, Cadillac Joe, Survey Eros, Pipe Circus, the Junkers, Survey Eros, Mudride, etc.) on three stages. Saturday, February 16 in the Corral Room, Tornado Club, as part of the "Dental Jam," a benefit for the dental work of beloved uninsured Madison musician Catfish Stephenson. Featuring Aaron Scholz, Wendy Schneider, Duke Abbott & Break-up City, Jessica Lee, Marissa, Joey Dunscomb, James Lee, Moonfunshop, Cashbox Kings, Fiddle Dave & Banjo Kyle. Saturday, December 29, 2001 at the Club Tavern, opening for Madison's favorite blues band, Cadillac Joe and the Blind Wolf Blues Band. If you haven't seen those guys play, you've got to do so. Mark's extended past starts here. He arrived in Madison in May of 2000 open to anything and started by exploring a two-songwriter band with Ken Labarre, now in Tangy. Two songwriters = fun discussions, good quality control. The two met with a number of musicians before discovering to their surprise that neither of their egos could really cope with sharing power. This period resulted in the addition of drummer Trent Sinclair (now of The Mighty Short Bus/Whiskey Creek), drum teacher and antique drum afficionado at Good n' Loud Music. Sometimes, Trent plays standing up, which is groovy. 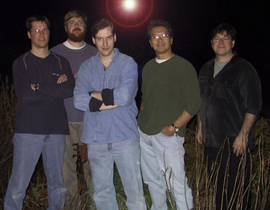 It took Mark and Trent until 2001 to add keyboardist/singer Erik Anderson and busy bass man Ken Keeley (Shauna Wells /Julie Scharm/Area Man/Verb/Nazarenes/Ken Labarre's old band) and name the band The Lint Emporium. This band played one show, which did get recorded in nice multi-track and will be remixed and made available at some point. 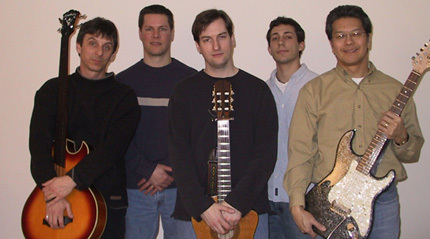 The search for a lead guitarist lasted until around August, 2001, with Jim Low, whose vast experience and professionalism really raised the bar for the band. Trent had since gotten busy, so Jim's former bandmate's son, Jim Turk was soon added, with most pleasing results. 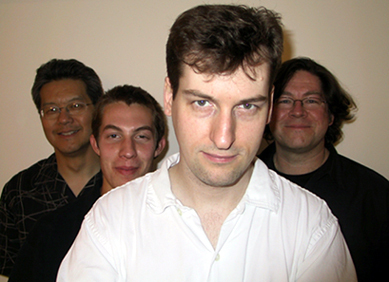 The resulting tight, spicy, and quck-learning five piece had worked up about three hours of material, played several shows, and recorded 2 EPs by April, 2002. Erik then got busy enough to stop being a full time member, and after a few shows as a four piece, Ken quit his job and went to grad school, leaving him with less time than Madison Lint required. A new keyboardist (K.C. Casimir) and bassist (Tim Peeters) were worked up for one fabulous weekend show in August, after which both of the new guys promptly quit. Tom Broeske, our highest profile (formerly signed to Zoo Records, played with members of Wilco on an album by Tommy Keane, appeared on Conan O'Brien with Milwaukee's Spanic Boys) bassist yet, was signed on by November, 2002 for some shows and session work. Excellent jazz keyboardist Luke Palmer joined in January, 2003. This promising five-piece lineup sounded great, but few shows were appearing despite the band's having acquired (around 11/02) the services of a well-known Madison booking agent. Tom, Luke, and Jim Turk all got more involved with other projects while the band met up again for a show and recording session during the summer with old bassist Ken Keeley. Madison Lint has reached a confidence level to be able to take Mark's solo output and swap other players on a show by show basis. Jim Low has remained a dominant voice in the band with his sweet lead guitar work. Ken Keeley has been our steady bass man, with Evan Wanserski filling in for some shows late last year. For fall-winter '03, the drum chair was filled by prodigy Dave Scalia (all star high school jazz band), with Dave's brother Michael Scalia adding some very strong backing vocals and some percussion to a couple of shows. For shows in early 2004, Marcus Looze (Spontaneous Throwdown, Gravity Room) added his creative, energetic playing to shows and recordings. The band has open-ended commitments from many of our former members for additional engagements, plus (with varying degrees of conviction) from a number of Madison's best known bassists and drummers. The flexibility to employ such luminaries for particular dates supports Madison Lint's ethic of keeping things things a little unpredictable. Special thanks to Brian Casey at rootlevelservices for providing web space for this page.